Maybe you cynics out there assumed this was another example of police abusing their authority to hassle someone who embarrassed them, but no. It is another example of people with outstanding warrants not staying out of the limelight. According to the Daily Advance in Elizabeth City, North Carolina, police who had been looking for a 24-year-old man in connection with a pair of local break-ins found him after he won a doughnut-eating contest at an anti-crime event last Tuesday. The event was the local version of the "National Night Out Against Crime," the purpose of which is "for citizens and police to come together, standing in a united front against crime." Activities include live demonstrations by K-9 units, safety education, a basketball tournament, and many others. "Don't be surprised if you even witness a doughnut-eating contest!" the website says. 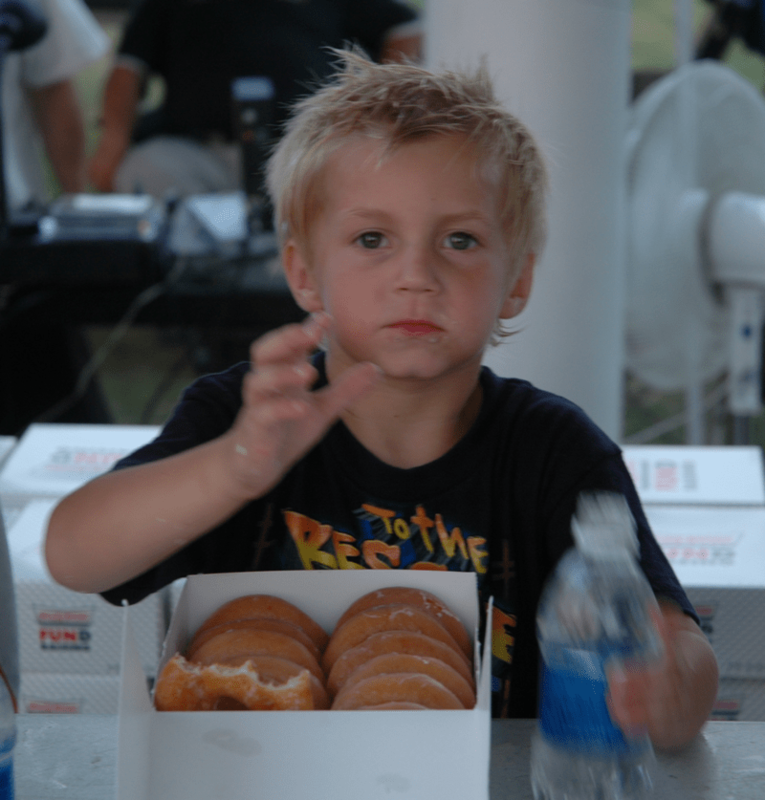 Authorities arrested [the suspect] on Wednesday, one day after he won the adult division of a doughnut-eating contest at the Elizabeth City Police Department's National Night Out Against Crime. [He] ate eight doughnuts in 2 minutes, beating a group that included local police officers and firefighters. It's not entirely clear, actually, how the win led to the arrest, but it looks like he was not recognized at the event itself. According to Reuters, the report of the man's doughnut victory "caught the eye" of a local sheriff's lieutenant, who said they had been "trying to interview" him for months because he was suspected in two burglaries. It sounds like they renewed their efforts to locate him after learning he was in the area because of the report he'd won the face-stuffing championship. In any event, they did find him the following day and brought him in. "Congratulations on your win last night," the lieutenant reportedly said, before arresting the man. One door opens, another one closes, isn't that how the saying goes? For a couple of incidents that are at least similar enough that they just popped into my brain, see "'Safe Surrender' Program Draws Hundreds Not Wanted for Anything" (Nov. 13, 2010); and "Video Ruins Yet Another Workers' Comp Claim" (Mar. 26, 2008).